Mali midfielder Seydou Keita has left Barcelona after a trophy-laden spell during his four years at the club. 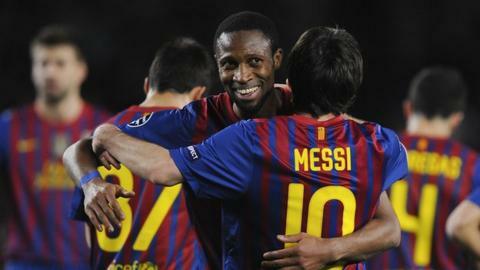 "Seydou Keita has announced tonight he will not continue with the club next season," Barca said on Saturday. "Barcelona thanks Seydou Keita for his contribution over the past few years and wishes him more professional and personal success in the future." Keita, who won 14 trophies during his time with Barca, has left to sign a deal with Chinese side Dalian Aerbin. The Chinese Super League club say that Keita has signed a two-and-a-half-year deal and that he will join them on 16 July. The move continues a recent trend for a handful of African footballers, with Didier Drogba,Frederic Kanoute and Yakubu Aiyegbeni all joining Chinese Super League clubs in recent weeks. Keita, 32, joined Barcelona from Sevilla in 2008 and was the first signing of Pep Guardiola, who had just taken over as coach. Spanish media report that Keita had a clause in his contract, which had been due to expire in 2014, allowing him to leave on a free transfer if he did not start at least half of last season's games. Guardiola used the Malian almost exclusively as a substitute and the player helped Barca win three Spanish leagues, two Champions Leagues and two King's Cups among other trophies. The coach stepped down at the close of the season with assistant Tito Vilanova replacing him. The Mali international previously played for French clubs Marseille, Lorient and Lens before moving to Spain where he played for Seville for one season.